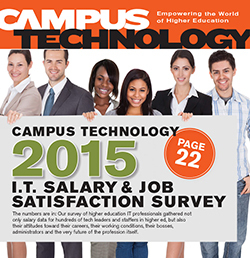 Our survey of higher education IT professionals gathered salary and job satisfaction data for hundreds of tech leaders and staffers in higher ed. An app called SKIES transforms a traditional lecture into a shared learning experience. "Making" experts share the basics of building spaces for collaboration and hands-on learning. A new generation of mobile apps is enhancing public safety at colleges and universities. 8 ways to make the best use of the data coming out of the campus learning management system. Austin Community College transformed an aging shopping mall into a revitalized campus hub and high-tech learning lab. To improve retention and outcomes for Pell grant students, Ball State University developed a mobile app that uses gamification to incentivize positive activity outside the classroom. At South Mountain Community College, a homegrown Learner Support System gathers data on students' usage of campus resources, streamlining the tutoring process and improving outcomes.